Lee Hyun-min, 31, frequents a small bookstore Mystery Union whenever he feels like reading a spine-chilling thriller book. “The store is small and hard to find, but I bet almost every mystery lover in Korea would know this place,” Lee told The Korea Herald. Just like Lee, a growing number of Koreans are hunting for books at small yet specialized bookstores. While large bookstores continue to dominate the market, small players are discovering their own profitable niche. According to research done by a bookstore map app FunnyPlan, about one out of four small bookstores in Korea in 2017 were newly opened ones, with less than a year in operation. The research indicates that most of the small bookstores feature specific themes, including mystery stories, cats, poets, beers, travel and psychology. Unlike the book displays of big offline bookstores, which tend to focus on titles from leading publishers, small specialty bookstores tends to reflect the owners’ tastes in their book title selection. A “Today’s bookshelf” from the poetry bookstore Wit n Cynical, for example, shows the books selected by its owner and poet Yoo Hee-kyung, depending on his mood of the day. The closer space between bookstore staff and book hobbyists is another reason to visit the small bookstores. “The store’s compact space allows guests to initiate a conversation with the staff more easily, compared to the large bookstore chains,” Yoo Soo-young, the owner of Mystery Union, said. Specialty bookstore staff also have more chances to offer professional help to customers on choosing books. Cultural events hosted by these small bookstores also offer opportunities to meet people with similar reading preferences. More than six out of ten small bookstores in Korea are holding cultural events regularly, according to the FunnyPlan’s research. Types of activities vary from a reading club to reciting sessions to drawing class to an author talk. A cat-themed bookstore Schrodinger, for instance, regularly organizes events such as “How to draw cats” or “How to overcome pet loss,” targeting local cat-lovers. Event participants often become the book shop’s regular customers. The following are some of the widely known specialty bookstores in Seoul. If you are looking for books related to cats, you’ve come to the right place. Deriving its name from the quantum physics experiment “Schrodinger’s cat,” the bookstore has more than 500 books solely focused on cats. With the rising popularity of cats as a pet in Korea, the store has also garnered great popularity among cat owners in Korea. In 2017, the store has doubled in size and moved to Ihwa-dong. Schrodinger’s owner and manager, who themselves keep four cats respectively, visit Japan and other countries once a month to buy new books on cats. The staff proudly show off their rare collections of the books on “Boasting Bookshelf,” which stands at the corner of the store. 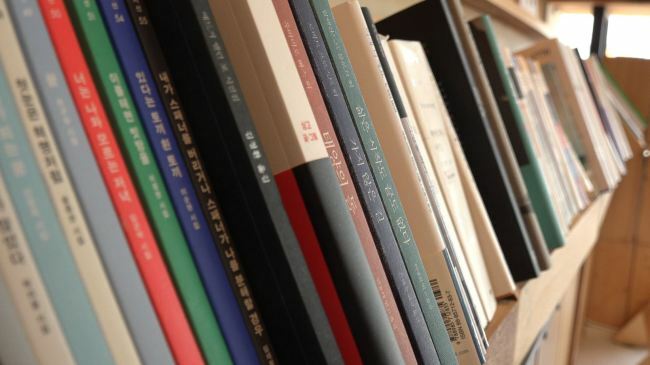 Even though Schrodinger has many books imported from Japan, most of its books are written by Korean authors and illustrators, according to manager Seo Ji-woo. 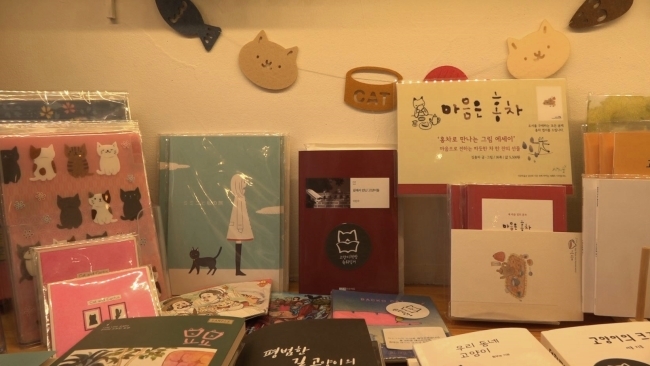 The bookstore also sells various stationery items related to cats while exhibitions take place on one side of a wall with the theme changing every three weeks. Check out further information on Schrodinger’s official Instagram. Address: 19 Naksan-gil, Ihwa-dong, Jongno-gu, Seoul. Hours: Opens 1:30 p.m. to 9 p.m. Closed on Monday. Just like Platform 9 3/4 from the book Harry Potter, it’s not easy to find this bookstore named Mystery Union. Hidden in a street corner near Ewha Womans University, the 16-square-meter store welcomes mystery buffs from Wednesday to Sunday. The store has more than 1,700 titles in the mystery genre, including detective, thriller and crime stories. Under the store’s theme “Rediscovering the forgotten mystery books,” Yoo carefully curates the books and regularly changes the display. By separating bookshelves according to the nations and authors, the owner aims to help customers find books easily. Yoo said she rarely initiates conversation with customers looking for books to avoid disturbing them. The bookstore owner, however, is always ready to help them find a book if they want. “I recommend books based on individual customer’s taste. The close relationship between the owner and guests is the best part of (running) a small bookstore,” Yoo said. Mystery book lovers can create a network through various events such as author talks and mystery book reciting session. The schedules can be found on the bookstore’s Instagram. Reading books while drinking some beers may sound like an unusual pairing, but some books indeed call for a sip of refreshing beer. 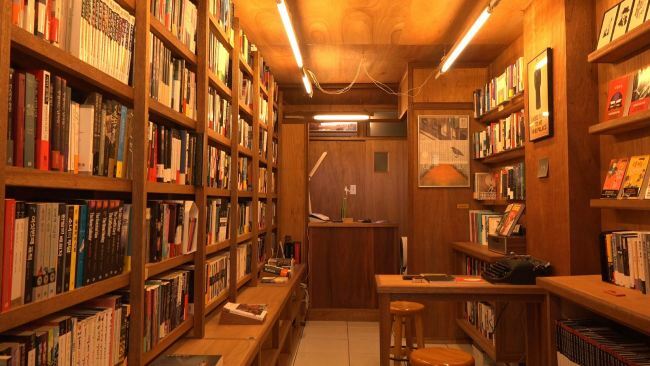 Book by Book, located in Sangam-dong, serves up various items including beers and chips. When an order was placed, a staff member was seen dispensing the booze from a draft beer tower installed at the counter. Guests can enjoy reading books and drinking beer at a bookstore lounge. The bookstore offers almost every book genre, while the displays change depending on the trend and customers’ book tastes. The handwritten tags attached on bookshelves show the themes of the books. Bookmarks made by customers are another feature of the bookstore. The readers can leave their comments about a book on a coated piece of paper and share it with others by putting the bookmark inside the book. The store offers free coffee to customers who make the bookmark. Book by Book also acts as a bridge that connects creators and readers. Every blank on a calendar on a wall is filled with various sessions. About 10,000 customers took part in the authors’ talks, which was held more than 600 times at the bookstore. The success of the bookstore led the owner to open the type of store in Pangyo, Gyeonggi Province and Gwanghwamun, Seoul. Address: 19-4 Sangam-dong, Mapo-gu, Seoul. Hours: Opens 11 a.m. to 11 p.m. on weekdays, Noon to 6 p.m. on weekends. A poet, who had also worked as an editor for more than 10 years, quit his job and opened a bookstore named Wit n Cynical in 2016. It features about 1,600 books of poems. Most of the books are written in Korean, but translated poetry collections are also available. “I opened (my bookstore) here as I needed a place to write. Also, I’ve always wanted to plan and hold cultural projects on my own,” said You Hee-kyoung, the owner of Wit n Cynical, in an interview with The Korea Herald. Twice a month, You holds poetry reading sessions with local poets at the bookstore. About 50 people fill the seats every time, according to You. Famous poets including Park Joon, Kim Hyun and Lee Won have participated in the events. “As a poet, I want poetry to thrive in the country with Wit n Cynical,” You said. To find the store’s upcoming events, visit Wit n Cynical’s Instagram. Address: 22-8 Sinchonnyeok-ro, Seodaemun-gu, Seoul. Hours: Noon to 11:00 p.m.